If you have any questions regarding Special Education Eligibility, please contact us for a FREE SPECIAL EDUCATION ELIGIBILITY CONSULTATION. Within a scientific, research-based intervention process, school teams are able to use student progress data collected at each tier to document a student’s progress. Student progress monitoring is an on-going teacher practice that use student performance data to continually evaluate the effectiveness of their teaching and make more informed instructional decisions. • Responds to the interventions but is not able to maintain his/her performance if the intensity level is decreased or the interventions are faded. It is also important to note that a parent may request a special education evaluation at any point during the intervention process. The district must fully consider the parents’ request and decide whether or not to conduct the evaluation. The district must then notify the parents in writing of its decision and the reasons for that decision. 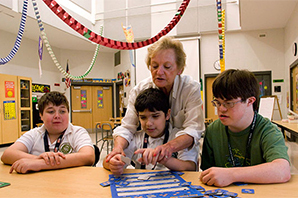 State special education regulations require that school districts must use the special education evaluation process when a specific learning disability (SLD) is suspected. A district may also, but is not required to, use a severe discrepancy between intellectual ability and achievement as part of the evaluation process for determining whether a child has a SLD. However, they will not be able use severe discrepancy alone to determine eligibility. If you need an effective Special Education Eligibility Attorney, please contact us for a FREE SPECIAL EDUCATION ELIGIBILITY CONSULTATION.